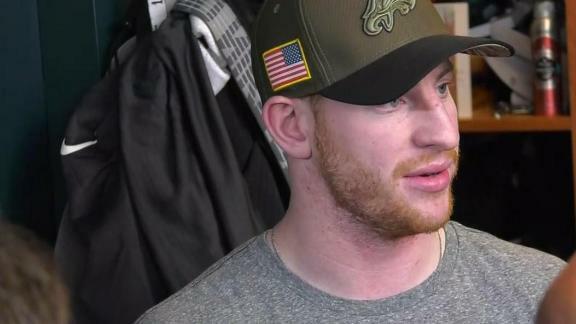 PHIILADELPHIA — Eagles quarterback Carson Wentz spoke to the media for the first time since tearing his ACL against the Los Angeles Rams in December, and revealed that he also tore the LCL in his left knee during that Week 14 game at the Coliseum. Wentz does not anticipate the additional damage will significantly impact his length of rehab, and he is aiming to be on the field for the regular-season opener in 2018. Wentz came up limping after a diving touchdown run that was negated by a holding penalty in the third quarter against the Rams. He stayed in the game for the remainder of the drive, which he capped with a fourth-down touchdown pass to Alshon Jeffery that gave the Eagles the lead. Nick Foles came in to replace Wentz, and the Eagles went on to beat the Rams to clinch the NFC East. Wentz said he won’t alter his playing style as a result of the injury. Wentz attended practice Thursday and was moving around without the assistance of a cane. He is now walking under his own power for the first time since the injury. Foles is 4-1 in five starts — including two playoff victories — since replacing Wentz and will be the starter in?Super Bowl LII against the New England Patriots.